The new Hurricane Delfin DG Exp50 range A3 stage aluminium carbon fibre and steel fully approved vacuum cleaner system works to reduce the risk of highly combustible materials in the repair process. Delfin have as a direct result of working hand-in-hand with international motor makers developed this approved high power vacuum. With their expertise the three phase industrial vacuum machine easily copes with the different rates of vacuum speed of materials such as aluminium, carbon fibre and steel particles which require differing rats of extraction speed in the dust free extraction process. 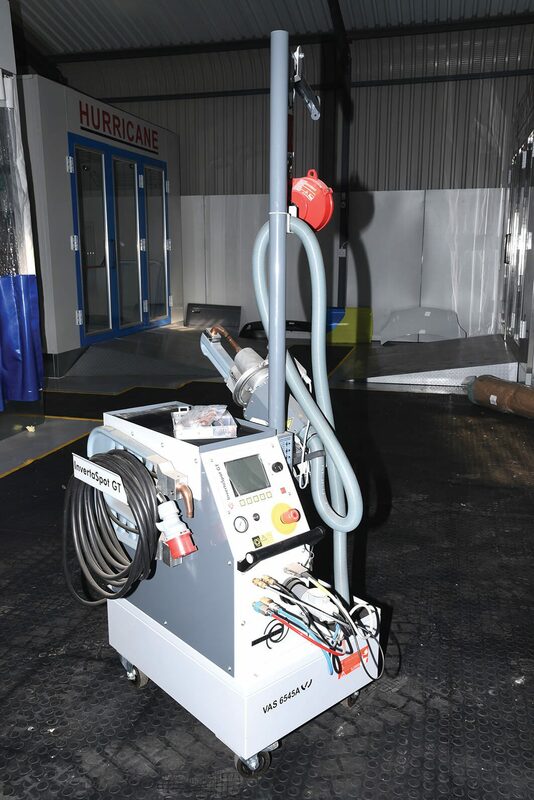 As toxic small dust is totally removed from the work space in body repair the robust design and large capacity vacuum collection make the DG50 an excellent investment as it is designed for continuous workshop use as a sucking unit, filter unit and collection unit. The suction is provided by a suction unit of the side channel blower type explosion proof certified for ATEX Zone 22, and labelled II 3D. It is completely maintenance free for round-the-clock 24 hours duty, very silent; a safety thermal switch that cuts the motor in case of overheating. All electrical components, including the power switch, are EX rated and certified; a vacuum indicator enables constant checking of the suction performance, and detecting possible clogging of the filter. A pressure relief valve secures constant cooling of the motor, even in case of heavy-duty service or accidental clogging of the filter. The filter is placed and protected inside the steel filter chamber; the filter is made of conductive antistatic polyester, tailored with pockets in order to increase the filter surface (30 000 cm@), with high filtration efficiency (class M, 1 micron). An additional H 14 /HEP filter cartridge guarantees the retention of the smallest dust particles. A manual filter shaker enables the user to clean the filter efficiently by a vertical shaking movement so as to detach most of the dust and maintain the filter clean, in order to increase its life and maintain the suction performance of the machine. A suction inlet with spark trap device eliminates sparks that might generate internal explosions if in contact with flammable materials. The vacuumed material is placed inside a drop-down bin mounted on wheels (100 litres capacity) with possibility of using standard disposable bags or special seal off bags for toxic and hazardous dust. The vacuum is mounted on a sturdy steel chassis with antistatic wheels, one of which has brakes; all metal parts of the vacuum are epoxy painted, and electrically grounded.